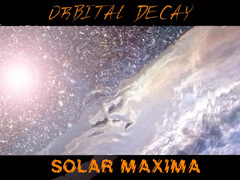 Listening to Solar Maxima (69'08") by Orbital Decay one would believe that digital synthesizers had never been invented. Existing on a plane outside the oppressive rush of modernity, this music quotes the classics of spacemusic without mimicking them. Synthesist Terry Furber and guitarist Scott Watkins demonstrate a masterful grasp of the vintage gear around which the spacemusic genre gravitates and explore the past in a new way. The six tracks on this CD are studio-perfected versions of live jams originally found in the act of making. Creating layers of space with harmonies warm and golden, pumping sequencer patterns and strident lead lines, this duo explores the inner darkness of electronic music - yet out on the verge of ethereality their music gleams like new. Summoning the ghosts of the 1970s, Orbital Decay's music feels like Phaedra, Meddle and Wired recollected in tranquility. With the mythic qualities of their instruments channeled through our most authoritative interpreters, Solar Maxima comes dangerously close to a masterpiece.